Each GolfEurope.com-recommended hotel has been stayed in and approved by an editorial staff member. Overlooking the 18th green of the Old Course and a favorite of Bobby Jones, the Macdonald Rusacks is a golf traditionalist's dream. The circa-1887 hotel has been stylishly remodeled and expanded, with 68 en-suite rooms, 24-hour room service and a new dining room at the Old Course Restaurant. Each year during the Dunhill Links Pro-Am, the Rusacks hosts numerous touring pros, and a limited number of guaranteed Old Course tee times are available for guests. Popular among Scots for weddings as well as golf, the Green Hotel features traditional four-star accommodations in the town of Kinross, close to Perth, Dundee and St. Andrews. Spacious rooms, a leisure center, restaurant, pub and an extensive shop offering casual and formal clothes are among the amenities. Guests also receive a significant discount at the two hotel-owned courses across the street, recently renamed the Montgomery and the Bruce. Located right on the first tee and overlooking the 18th green of the famous Championship Links, this is the obvious choice in Carnoustie. Staying here gets you guaranteed tee times on the 2007 Open Championship venue and package deals on Carnoustie Golf Links' two other courses. For leisure there's an indoor pool, hot tub, sauna, steam room and spa offering a variety of massage and body treatments. Full conference facilities are available as well. Fine dining and beautiful course views await at the on-site Dalhousie Restaurant, featuring award-winning chef Paul Whitecross. Just a few miles from downtown Edinburgh (and located next to a bus stop for an easy hop to the center), Allison House is an affordable, convenient and friendly three-star B&B. There's parking for guests, and fairly simple on/off access to the motorway. Web surfers will enjoy the hotel's free WiFi, a rarity at Scottish hotels. Just turned 100, the Westin Turnberry is among the world's great golf resorts, frequently visited by the legends of the game and an ideal place to stay if you're thinking all golf all the time. The Ailsa course, one of two here, hosted the famous Tom Watson/Jack Nicklaus "Duel in the Sun" at the 1977 Open Championship and is the tournament's 2009 venue. Turnberry also has pitch 'n' putt and 18-hole putting tracks, plus a spa and an excellent restaurant. 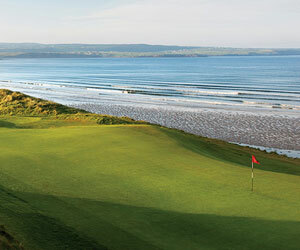 This small, cozy three-star hotel overlooks the famous Prestwick Golf Club, host of the inaugural British Open. The on-site restaurant offers complimentary breakfast. The town, train station and Firth of Clyde beach are a short walk away, and it's only a few minutes by car to Prestwick International Airport. This five-star retreat on the shores of Loch Lomond will get even better for golfers when it opens The Carrick club just up the road in spring 2007. Guests will have the option to ride via motorboat across the loch to the new course, or stay at its variety of accommodations. Aside from the main hotel, Cameron House also rents out luxury lodging overlooking the nine-hole Wee Demon course; among the neighbors might be Colin Montgomerie, who has a timeshare here. An overachieving two-star in the village of Glenfarg, this hotel offers great value and access to more than 70 nearby courses. The 19th-century castle-style hotel once accommodated passengers on an old railway that wound through the town. The 17 guest rooms are basic but comfortable, and most have free WiFi. The hotel can assist golfers in arranging tee times, and the Taylor Restaurant is a local favorite for fine dining. There's also a casual bistro, and a bar next door. Steps from Royal Dornoch Golf Club, the four-star Royal Golf is the premier place to stay while playing the jewel of the Highlands, overlooking the first hole and the beaches of Loch Dornoch. The 25 stylish rooms are individually decorated and feature WiFi and direct-dial telephones. The dining area and lounge sport large windows offering views of the golf course and boast extensive wine and single-malt selections. Set on 20 acres just around the corner from Nairn Golf Club and seven miles from Inverness Airport, the Newton Hotel and Highland Conference Centre is a four-star spot with three-star prices. The hotel features 56 rooms, full conference facilities and amenities like access to the nearby Golf View Hotel's tennis courts and leisure center. Area attractions include Inverness, Culloden Moor and Loch Ness. A favorite of golfers who enjoy the Highlands and the comfort of staying in a smaller, inn-like setting - but who also demand quality service and stylish surroundings. All rooms at the Claymore House are en-suite with baths or showers and have direct dial telephones, remote control color TV, hair dryers, and tea and coffee making facilities. The conservatory provides a quiet lounge for guests or diners or allows more open space for bigger functions such as weddings or corporate conferences. Area attractions include Inverness, Culloden Moor and Loch Ness. This five-star hotel just outside Aberdeen offers easy access to northeast coastal courses. Despite its central location, 11 secluded and wooded acres give the hotel a retreat feel. Cozy guest rooms mix classic furniture with a modern, fashionable fee. The Conservatory restaurant serves Grampian produce, Aberdeen Angus beef, game, and fish and shellfish from local rivers and ports, and its cellars stock more than 400 wines and 100 malt whiskies. The hotel has spa facilities and can arrange fishing and shooting trips. Located just across the street from the world-famous Cruden Bay Golf Club, the Red House makes a wonderful base for golfers exploring the Grampian area. Rooms are tidy and comfortable and the food (from traditional, hearty Scottish breakfasts, to dinners in the pub) is outstanding. Just 25 minutes north of Aberdeen by car. Have you tried Scottish sites? I don’t know if they have any Christmas 2009 or New Year 2010 left but www.cottages-and-castles.co.uk is a big site and does show availability. Have castles for rent !! J Good luck and let us know what they are like.